Joel Osteen’s Sunday message this week, “It’s Only a Test”, was about how facing up to trials or “tests” can improve one’s character. He led off by quoting the first half of I Peter 4:12 : “Beloved, do not be amazed and bewildered by the fiery ordeal which is taking place to test your quality…” (Amplified Bible). The historical context of this exhortation by our first Pope was the Neronian persecution, during which Christians were used as human torches to light the Apian Way, but it was not fiery ordeals of that nature that Joel had in mind, rather, he next listed as tests of character: traffic jams, dealing with irritating people, being tempted to worry, feeling jealous, etc. The quotidian stuff of life. And yet, in principle, it is true that our character is tested by these day-to-day trials — though it would be a stretch to categorize them as fiery. Osteen is very right in saying that when we are obedient in these small day-to-day tests our character is refined. He makes the point that we may often pray for God to change our circumstances, when God is more interested in changing us. He knows what circumstances are needed to act as sandpaper to polish us. Osteen misspoke several times in this week’s broadcast by saying that our trials give us a chance to reveal our character to God, or reveal our obedience to God. He should have said that we can demonstrate our obedience to God because we cannot reveal anything to God who, as the smallest Catholic child learns in catechism, “knows all things.” God allows our circumstances to reveal our character, not to Him, but to ourselves so that with the help of the Holy Spirit we can take steps to grow in virtue. Although this is a minor point of criticism, Protestantism has an ongoing problem with diminishing the attributes of God. This should help us to appreciate our Catholic faith which is so careful in the language it uses to speak about God. Annoyance with inconveniences, irritations with other people, and impatience with the ordinary frustrations of daily life — they do not seem all that serious. Does God really care about them? He certainly does! 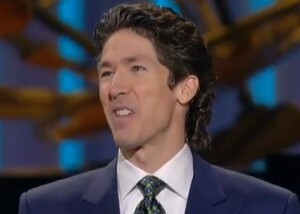 Joel Osteen was right in pointing out that these things are tests and that God does care about how we deal with them. We should ask for the grace to develop the virtues of patience and self-control. Medical science has demonstrated that negative emotions such as anxiety and impatience have negative effects on all of our bodily systems and on our mental functioning, not to mention the damage they can do to our relationships. Besides, if we rein ourselves in, control ourselves, practice self-mastery in these small things while relying on the aid of God, we strengthen ourselves for those times when the test is truly fiery.